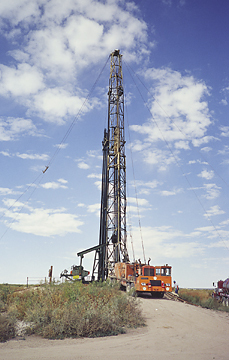 Researchers at the Bureau of Economic Geology and the New Mexico Bureau of Geology and Mineral Resources have completed a Department of Energy (DOE) research initiative titled "Play Analysis and Digital Portfolio of Major Oil Reservoirs in the Permian Basin: Application and Transfer of Advanced Geological and Engineering Technologies for Incremental Production Opportunities," which was designed to increase reserves and improve recovery of oil from existing reservoirs in the basin. This project was part of DOE's Identification and Demonstration of Preferred Upstream Management Practices (PUMP II) for the Oil Industry program. The target of this study was the Permian Basin of West Texas and southeast New Mexico, which, containing 29% of estimated future oil reserve growth (Root and others, 1995), has the biggest potential for additional oil production in the country. Workers on the project (1) developed an up-to-date portfolio of oil plays in the Permian Basin of West Texas and southeast New Mexico, (2) studied key reservoirs from some of the largest or most active plays to incorporate information on improved practices in reservoir development in the portfolio, and (3) submitted a Final report to DOE. Workers on the play portfolio grouped into plays all 1,339 reservoirs in the Permian Basin having a cumulative oil production greater than 1 million barrels and summarized key reservoir characteristics and preferred management practices of each play. The project updates and expands the information in the pioneering volume Atlas of Major Texas Oil Reservoirs (Galloway and others, 1983), which included only reservoirs in the Texas part of the Permian Basin that had produced more than 10 million barrels of oil. The Final report (pdf format) to DOE has been posted on this web page, as well as the reservoir database (Excel format) and PDF versions of the play maps. The report will be published as a BEG Report of Investigations on a CD-ROM containing the database of reservoirs within each play, maps in Geographic Information Systems (GIS) format showing play outlines and reservoir locations, and summary information on reservoir heterogeneity and development practices. Galloway, W. E., Ewing, T. E., Garrett, C. M., Jr., Tyler, Noel, and Bebout, D. G., 1983, Atlas of major Texas oil reservoirs: The University of Texas at Austin, Bureau of Economic Geology Special Publication, 139 p.
Root, D. H., Attanasi, E. D., Mast, R. F., and Gautier, D. L., 1995, Estimates of inferred reserves for the 1995 USGS National Oil and Gas Resource Assessment, U.S. Geological Survey Open-File Report 95-75L, 29 p.